The 2017 Mazda Miata, because Mazda hasn’t updated its photo collection yet. The 2019 Mazda Miata that got a big power bump to 181 horsepower will be at dealerships soon, meaning its 155-HP predecessors will get the “Please, take this car” markdown treatment on lots. 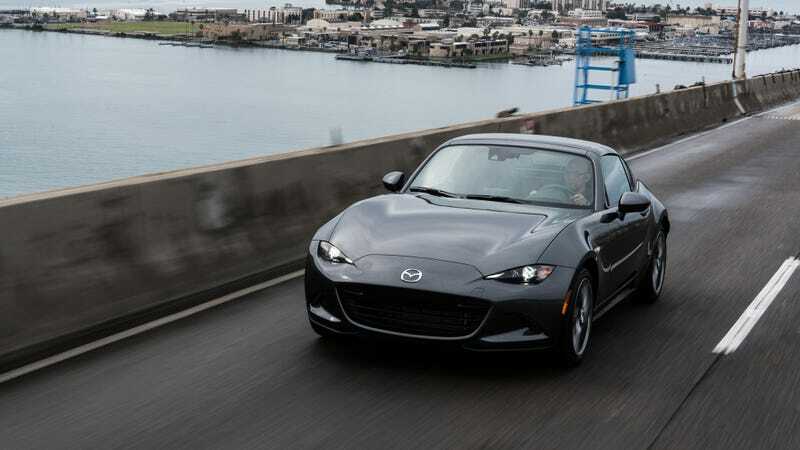 But, incredibly, the new and far more powerful Miata’s MSRP is only a few hundred dollars more than the 2018 car. For three decades, Mazda has had almost everything down on the Miata—a meager curb weight, an even weight distribution and the kind of road handling that makes you feel like you have a purpose in life. The company has somehow managed to keep that formula down over the years, resulting in Miatas not having a huge handling difference from generation to generation. But the one thing the factory Miata hasn’t had, aside from the Mazdaspeeds of the mid 2000s, is power. Mazda finally gave us that in the 2019 car, popping in an extra 26 HP—a seemingly small number that makes a big difference in such a light car. And while you might have thought 26 HP and the 2019 Miata’s new 7,500-rpm redline wouldn’t come cheap, you were wrong. It barely costs more than the 2018 car, and there’s no hit to the fuel economy, either. The two lower Club trims are only $435 more for the new 181-HP Miata than they were for the 2018 car, and the higher Grand Touring trims are only $585 more. That’s only $16.73 or $22.50 more per horsepower, depending on whether you like cloth or leather seats. That’s a good deal. Imagine, in a perfect world with no logical restrictions, being able to hand somebody $16 for an extra unit of horsepower on your car whenever you felt like it. In a trip back to reality, though, those numbers don’t matter much outside of comparing original MSRPs (and wallowing in sadness, if you got sucked into paying close to MSRP for a 2018 car with way less power). The 2018 Miatas will get rushed off of lots when their more powerful successors come around in the fall, meaning anybody in the mood for a small car with a factory warranty will get to choose between sweet deals and sweet power. Or they could just go with a $5,000 Craigslist one and turbo it. Same difference, minus the warranty.